Manila (VNA) – Vietnam will work with Japan and Mekong nations to implement the 2015 Tokyo Strategy on Mekong-Japan cooperation and the Mekong-Japan Action Plan for Realisation of the New Tokyo Strategy for 2016-2018. 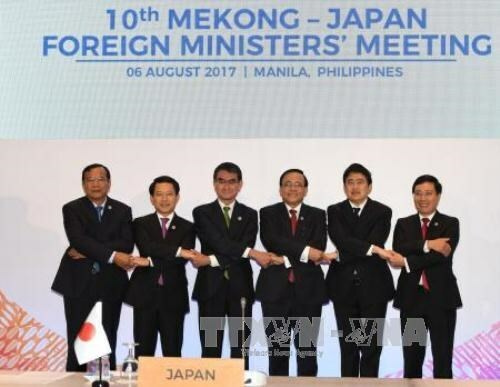 Deputy Prime Minister and Foreign Minister Pham Binh Minh reiterated Vietnam’s commitments at the Mekong-Japan Foreign Ministers' Meeting on the sidelines of the 50th ASEAN Foreign Ministers’ Meeting (AMM 50) in Manila, the Philippines, on August 6. The event was attended by the Foreign Ministers from Cambodia, Laos, Myanmar, Thailand, Vietnam and Japan. To help Mekong nations participate deeply in global and regional value chains, the Vietnamese FM suggested developing international traffic corridors and logistics system so the region can serve as a bridge connecting the Indian Ocean and Asia – Pacific, and be a gate to markets like India and ASEAN. Meanwhile, Japan should provide support for Mekong nations to shift toward green growth and energy saving models, to develop energy while ensuring energy, food and water security and to use water sustainably from the Mekong river while adapting to climate change, Minh said. He also suggested Japan help Mekong countries develop high-quality human resources and enhance research and development capacity to meet the demand of enterprises. During the event, participants discussed cooperation plans and preparations for the ninth Mekong – Japan Summit Meeting slated for November. Mekong nations lauded Japan’s support for promoting regional connectivity, human resource development and industrial infrastructure facilities via the Partnership for Quality Infrastructure, the Industrial Human Resource Development Cooperation Initiatives and official development assistance. The ministers expressed their determination to boost Mekong – Japan cooperation for peace, stability and prosperity in the region, and agreed to work together on other issues, including customs clearance and human resources. They also pledged to strengthen cooperation with the Mekong River Commission for economic growth.